Goldman Sachs and the clients who took the bank's 'big short' trade recommendation last month will be pleased to read a research note out of UBS that has received some coverage in the mainstream press on Wednesday. Though traders who are short Amazon or long CMBX might want to avert their eyes. According to the story about the note published by the Washington Post, UBS now expects some 75,000 stores that sell clothing, electronics and furniture to close by 2026, when online shopping is expected to make up 25% of retail sales, according to UBS. Right now, roughly 16% overall sales are made online. The closures will be broad-based, but UBS expects some 21,000 apparel stores, 8,000 home furnishing stores and 10,000 consumer electronics stores - among thousands of others - to close. To be sure, the US retail sector has already been hard hit by the Amazon-inspired "retail apocalypse" (though other factors, like the overbuilding of retail space during the pre-crisis years, have also contributed to the wave of bankruptcies). Since 2016, 35 major retail chains, and countless smaller ones, have filed for Chapter 11. 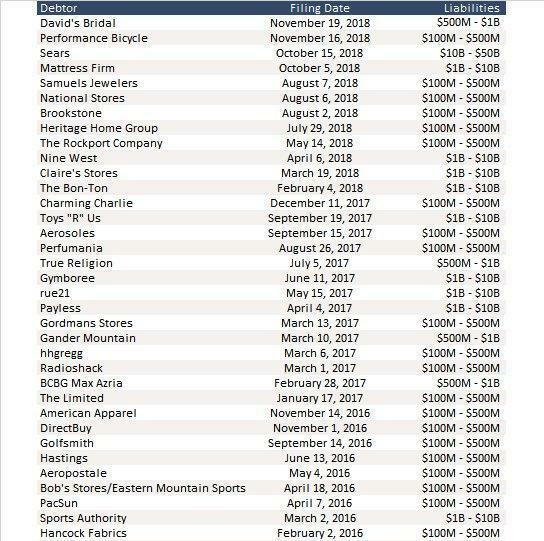 And a host of names not listed here have filed since the beginning of the year, including Diesel USA, Charlotte Russe and Shopko (meanwhile, Payless and Gymboree have filed for a second time). Even retailers that have somehow managed to avoid bankruptcy, like Sears, are still closing stores. The chain has already closed some 1,300 KMart and Sears stores, and is expected to close 80 more before the end of the year. Other retailers, like GAP, for example, have warned that more closures are on the horizon. But just like how a fire helps purify the soil, allowing healthy trees to survive and thrive, retail analysts believe this purge of uncompetitive stores will ultimately be a good thing for the industry. One called it a "healthy cleansing." "This is a healthy cleansing for the retail industry," said John D. Morris, senior brand apparel analyst for financial services firm D.A. Davidson. "We’re in the middle of a multiyear retail purge. Companies are finding that when it comes to stores, less is more." Looking ahead, the team from UBS said that although same-store sales ticked up last year after a decade of steady decline for the industry, investors shouldn't interpret this as a long-term bullish indicator. Rather, if anything, it should be attributed to the temporary sugar high of the Trump tax cuts, and should be expected to reverse this year. Analysts said in-store sales ticked up in 2018, in part because of tax cuts for some Americans. But those gains are likely to be reversed this year, said UBS analysts Jay Sole and Michael Lasser. Ultimately, the retail space could see some retailers that started with an e-commerce platform, like the unicorn mattress brand Casper (which should soon have plenty of capital for an expansion after its IPO), expand into bricks-and-mortar. But these stores will be smaller and hold less inventory. They will mostly function as physical showrooms for customers to try the products before buying them online. Even so, some Internet-only companies such as furniture retailer Wayfair and mattress brand Casper are beginning to open physical stores. But analysts said these outposts - often smaller and more sparse than traditional stores - function more as showrooms for items customers can order online than a one-stop shop with swaths of inventory. 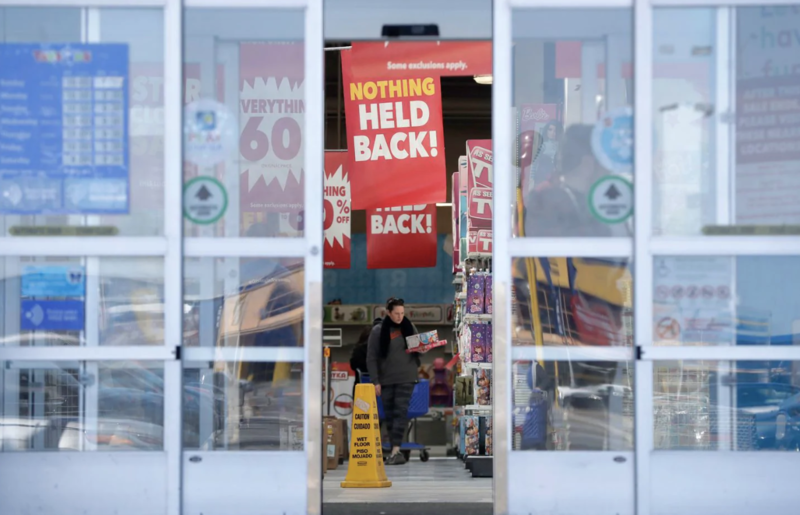 But as the consumer-spending drop from the government shutdown continues to ripple through the economy, expect see another welter of closures like the 465 stores that closed in one day. Because as we've pointed out, the "retail apocalypse" isn't over - it's just getting started.